The first time you attend a dinner party can be very nerve wrecking. Should I bring anything? Where should I sit? What if I don’t like the food? Is it polite to ask for seconds? This experience is similar to someone attending your Twitter chat for the first time. Like any other host, you want to make sure that your guests feel prepared, welcomed, and relaxed. How can you do this? By making sure you curate an amazing experience before, during and after the chat. Most importantly, you’ll want to tell a good story and not just bombard your guests with information. 2) It will encourage people to return to your chat and share it with others. Why run a Twitter Chat? While a Twitter chat is simply a Q&A discussion on Twitter in real-time, it is also an opportunity to share another side of your brand. Every day, your audience comes in contact with your brand in a very direct and straight-forward way. This chat however, can be an opportunity for everyone to relax and unwind, allow their personalities to come forward, and gives your audience the stage and the microphone. Scheduling this chat during a time where your audience is the least distracted (i.e, evenings) is best. These chats are a great way to learn the story of your audience, what they need, and how they’d like to have their needs met. Think of it as an intentional mashup of a quick study and a real-time exercise on learning about your audience. Don’t just focus on your special guests. Focus on how your audience responds to questions and comments, what they share with other guests and which points of discussion strike up the most engagement. The objective of any great Twitter chat is to create a community around your brand. A community needs many different types of people involved for it to thrive. This is not a time to make a sale, rather it’s a time to be of service to anyone that comes in contact with your brand during the chat. Use this experience as an opportunity to help others. There will be plenty of time later to make a sale , for now, make a connection. What do you want the purpose of your chat to be? Finding new customers? Improving your current customer experience? Teaching customers how to utilize your product or service? Setting the intention of your chat with your purpose will make it easier to select a topic. The topic or theme of the story must be made clear. Instead of making the chat about a broad topic, use it to hone in on a specific aspect of your niche. For example, if your company creates courses to help first time homebuyers, you can select a certain aspect of that journey to discuss during your chat such as “getting financial paperwork in order” or “how to purchase homeowner’s insurance.” Your chat should indirectly allow your audience to dig deeper into your company’s mission and values. List out your business goals and divide them into categories. Line those categories up with the needs of your audience. Where do you see alignment? Make the connection and pick a topic. A great way to tie in your purpose and your topic is with your hashtag. Keep it simple and make sure that it directly reflects your brand name. The most important part of your story, are your characters – in this case, your guests. When creating a dinner party, you want to make sure there is a good mix of personalities and backgrounds to ensure that the conversation is robust and dynamic. The same goes for your Twitter chat. A good rule of thumb is no more than four primary guests, who will share their insight. The number of followers of each guest helps your numbers but you want to ensure that the guests mix well as individuals and as a unit. Allow each guest to reflect a different aspect of your brand to keep the conversation interesting. Who are you following within your industry that you engage with on a regular basis? Who does your audience follow and why? Who does your audience share and engage with the most? Make sure that this particular guest has insight that aligns with your Twitter chat topic and has knowledge that your audience is seeking. Email them with background on your brand, what you hope to accomplish with your Twitter chat and how both audiences can benefit from the information shared during the chat. The best discussions are ones that involve your audience. Allow them to ask questions. Highlight and share their feedback. Encourage guests to chat with the audience directly throughout the chat and create a space where the audience can ask questions. You’ll know if you’ve created a successful chat by these three elements: You’ve connected others while being of service to your audience, you’ve connected others while creating a community around a shared experience, and you’re connecting others while building brand awareness. Notice that brand awareness is not the top benchmark. Why? When you’re entertaining guests, the focus is rarely about you. It’s about them. People will remember you more often when you are helpful, not when you spend the whole chat talking about yourself. And lastly, don’t forget to track your hashtags. Use tools like Keyhole to track impressions, reach and exposure to measure how impactful your Twitter Chat was. The data can be used to see which of your guests, questions, and attendees drove the most engagement. 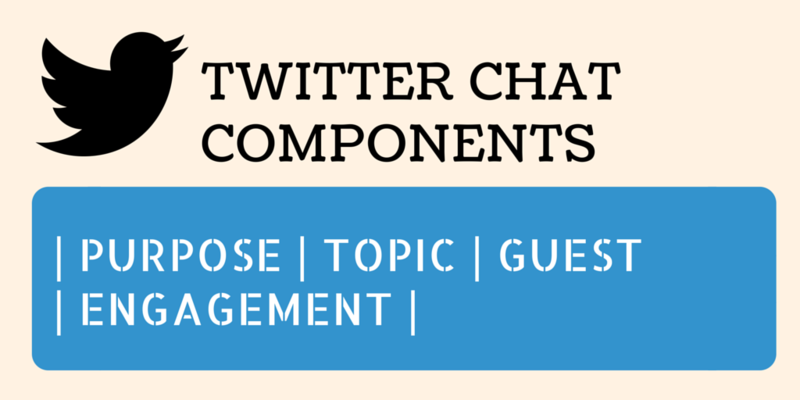 Use the information to optimize your future twitter chats.